EpigenDx is the world-wide leading Pyrosequencing service provider in the biotechnology industry. Our lab has nearly fifteen years of expertise in Pyrosequencing technology and assay design. We offer quality services, excellent customer support, and rapid turnaround time. Our design team is skilled in working with even the most difficult regions for epigenomic applications. Pyrosequencing is EpigenDx’s choice platform for loci-specific DNA methylation analysis since it is fast, cost-effective, and can accurately provide real-time quantitative percent methylation reads. This makes it ideal for applications involving allele quantification. A single Pyrosequencing run for DNA methylation is equivalent to sequencing 20 clones with traditional Sanger Bisulfite Sequencing. 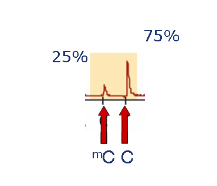 Measure the percent methylation levels of all individual CpG sites in a target region (PCR amplicon). Assess the average amount of DNA methylation globally in a sample. Quantify the amounts of two alleles at a basepair resolution. SNP and mutation genotyping via Pyrosequencing technology. Send us a custom target region with your gene of interest. We will design and validate the assay. EpigenDx determines validity of the PCR primers, designs Pyrosequencing primers, and determines the biotin labeled PCR primers.